THIS PRODUCT CANNOT BE RETURNED. ALL AFTERCARE PRODUCTS, BODY JEWELRY TOOLS, LEATHER ACCESSORIES AND APPAREL ITEMS ARE NON-RETURNABLE. 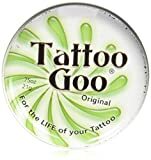 The Original Tattoo Goo in ointment form is the Natural Choice for healing your tattoo fast and for skin that is damaged, chapped, scraped, sun or wind burned from X-Treme sports. This unique formula based with herbs, oils, and vitamins known for their natural healing properties allows the skin to breath and helps to soothe the tattoo as it heals. The original is non-staining, has a pleasant natural smell, petroleum free, lanolin free, and mineral oil free. Ingredients: Olive oil, beeswax, cocoa butter, wheat germ oil, tocopheryl acetate (vitamin E), lavendar oil, sunflower oil, rosemary extract, D&C green 6. The tin is 3/4 Ounce. It is made of high quality material, durable and excellent for use. Perfect for used to hold pigment or ink for tattoo. These cup is a must for a current or future. 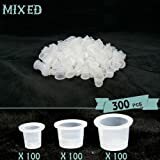 300 pieces Tattoo Ink Cups, Mixed Sizes #9 #13 #16. 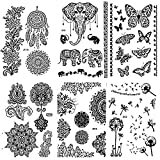 3.Package Included: 6 Sheets Tempoary Tattoo Sticker With High Quality in EU and US Quality Standard. 4. Easy to apply, transfer and remove without any glue. - If you are not 100% pleased with your purchase within 60 days,we can offer the replacement or full money back guarantee. Please kindly check our Brand Pinkiou and the Store Pinkiou Store.There is NO Quality Guarantee From Other Sellers.